Have a Trash Truck That’s Down? Need Maintenance? Whatever truck rep airs you need, from a little job to a big job — we’ll handle it for you smoothly and affordably. Just give us a call. We have some of the most highly skilled mechanics in the business. All with substantial waste management and trash truck experience. We fix them right the first time, and we have a large, on-site inventory of parts, both new and used. At Parris Truck Sales you can have peace of mind knowing that our mechanics know what they’re doing, AND…they won’t do things you don’t need. We fix what needs to be fixed and if we see anything of concern, we will call it to your attention. Our repair rates are highly competitive and our work is guaranteed. When your waste management vehicles, dump trucks and loader trucks come to us for maintenance or a problem that needs fixed, you’ll pay a fair price and we’ll tell you your costs up front before we do the work. 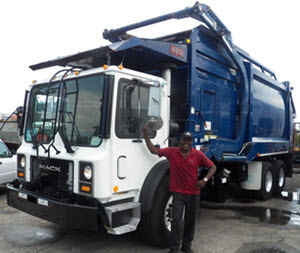 You’ll also have more than two decades of waste truck experience working on your vehicle. Truck repair quotes are FREE, just call us Monday through Friday. YES, we work on Saturdays, by appointment. And when you bring your trash truck in for repair – if it turns out the repairs are more than what you want to invest in the truck, we’ll show you a comparable waste truck that’s for sale, and work with you on price and payments. In all honesty, we are here to help you and we want you to feel good about any money you spend with us. PLUS – We thoroughly wash every truck before you pick it up! At no cost to you. Thank you for visiting our website, and keep our number for all your garbage truck/ loader truck needs! Visit our Truck Reconditioning page to learn about the meticulous reconditioning process that we execute to prepare our used trucks for sale.